« How to Adjust the Volume of a Single Window? How to Be Safe when Using Wi-Fi? In this video you would learn how to stay safe when using wi-fi. This software creates a virtual private network or in more simpler terms a sort of invisible connection with the Internet. This is a great tool to have if you are making online transactions or checking out important emails. Simply click on the “Download” button to save the installation file on your system. Once done, run the installation file and install it on your system. Once installed, you would get the hotspot shield icon in your tray. By default it shows that the Privacy Feature is On. Simply click on the icon and you would be displayed with a a menu You can “Connect” or “Disconnect” the application. 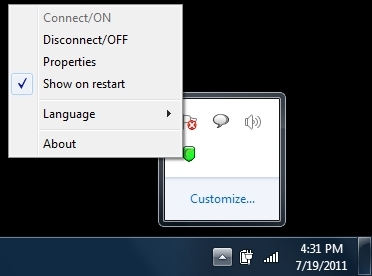 If you don’t want the application running every time you start your computer simply un-check the “Show on Restart” option. This is an effective tool to secure your internet connection.